Could you tell me the measurement of the normal size veil? I can't afford to buy one, and my friend can make it for nothing. I am just belly dancing for my husband because it is our 7 year anniversary and I want it to be special. Can you help me? 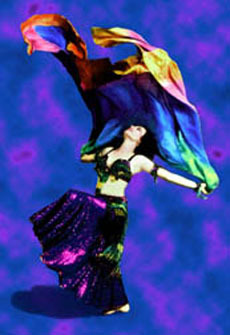 A "normal"-sized belly dancing veil is 3 yards long. But I recommend using your height as a guide. When the veil is draped around your neck, the ends should be an inch or two off the floor. If you are short (like me), that would be a little less than 3 yards. Some dancers use the 45" width or more, but if you're short, you might prefer prefer 36-40 inches. For practice or for a beginner, synthetic chiffon is fine, but I have to rhapsodize here about the exquisite floatiness of real silk. The gauze (labeled 4.5mm) or featherweight silk (5mm) is the lightest and floatiest. The 36" width is less costly, of course, than the 45'". It is usually available only in white and needs to be dyed, but silk dyes easily — I've done this at home with several types of dye, including plain old Rit. If you do this, remember that the silk, especially the gauze, will shrink a bit, so buy 1/4 yd extra. Narrow hem the raw edges by machine as small as possible. If the selvage edges are nice looking (as on silk), leave them as is, but if they're unattractive (like on some synthetics) then narrow hem them as well. If you choose to add a decoration, don't forget that any trims will add to the weight of the veil and make it less floaty. Also, the back of the veil may be visible, and you don't want unattractive stitching or glue showing. Paillettes and sequins on the edge add sparkle with very little weight, but they can get caught in your hair or costume, if you do a lot of veil work. For these reasons I leave my veils unadorned and let the airiness of the featherweight silk make its own statement. In this photo, Katia, an expert with veil work, is using an extra-large rainbow-dyed veil. Lisa, a reader of my web site, sent me email after noticing the references to dye on my web site to offer some cautionary advice. She is majoring in costuming in college, and shares some important health warnings to offer about working with dye. According to Lisa, the popular easy to use kind of dye that is sold in many craft stores contains a chemical that can cause liver cancer when exposed to it over long periods of time. The dye never really sets. When worn next to the skin in humid weather or when sweating, the moisture causes it to absorb into the skin. Because there is nothing to regulate dyeing products, this company was able to change its formula very slightly to keep it from registering as toxic, but it doesn't change the effects. For a veil which brushes the skin only fleetingly, there should be no problem, but it is a risk that people should be aware of. For this reason it is also very important to read and perform all of the safety measures when dyeing and setting colors. These commonly include wearing a dust mask and latex gloves. Thank you, Lisa, for sharing this important health information! Making A Semicircular Veil. Written by Shira. Describes how to make a veil in a half-circle shape suitable for one-handed work and double veil. Making A Rectangular Veil. Written by Shira. Describes how to make a rectangular veil. How To Make A Narrow Hem. Written by Shira. Describes how to easily make a narrow hem of the type mentioned in this article.